It was indeed lovely to get away… and so very far away, too! If my passport had been up to date, I could have hopped over to Mexico, just down the road. Where I was: Endicott West is an art retreat in Tucson run by the Endicott Studio people, and I was so happy to be able to go there, and spend some time decompressing, and exploring some ideas, and generally thinking deep thoughts. The thing I noticed about the area around Tucson: it is different. As a person who spends a lot of time imagining really alien landscapes, I rarely have the chance to actually inhabit an alien landscape; but the first thing I realized, as I drove away from the airport was how very, very different the natural world looked. Nothing that was growing looked like anything growing in New England. There was literally no resemblance. You see something that you think is a tree; you get closer, and realize that it has no leaves, but plenty of thorns. Is it a tree, is it a bush, is it a cactus? When you get some internet access, you look it up and voila! 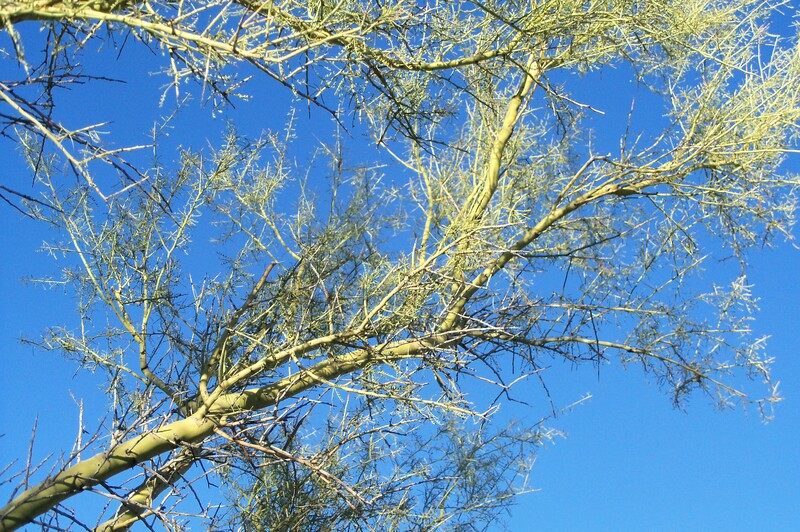 It’s a paloverde, and it’s dropped its leaves because of drought — but hey, that’s okay, because it photosynthesizes through its bark. Which is green. And all my finely-tuned student-of-nature intuitions are going what the heck? What the heck? This is not normal. 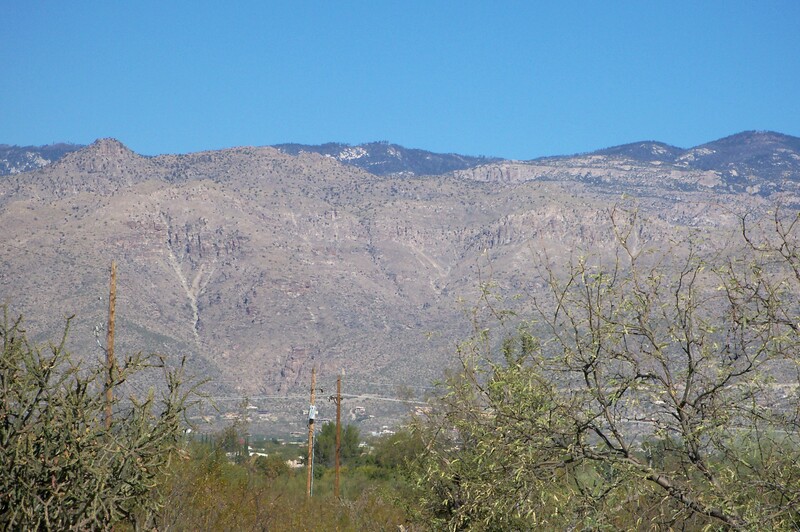 There are mountains in New England and there are mountains around Tucson, Arizona. And they do not resemble each other, except that they go up. And in New England, if you climb high enough, you get above the tree line, and there are no more trees; whereas in Tucson, if you climb high enough you get up to the treeline, and there are no more cacti. There are trees instead. Up there. This is backwards. Therefore: I love it. Those dark bits way at the top? Those are the trees. There were a handful of trees around on ground level: acacias, the paloverdes, mesquite, and here and there a pine of some sort. 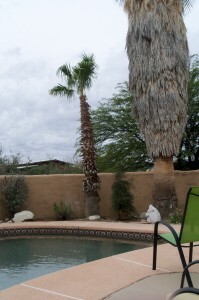 Oh, and palm trees, which are NOT native. Just imported and planted around town for that classy Arabian desert look. But in New England, the land is, when you get right down to it, mainly inhabited by trees, with room cleared for people, and roads and houses and shopping centers. The default setting is: trees. And that’s what your subconscious is expecting, and that’s exactly what it does not get in and around Tucson. I can’t adequately express how refreshing that is. And in a way, comforting… am I the only person who finds the unfamiliar to be comforting? Well. Must stop blogging. Must write Stuff. Lindig: got it right in one! And yes, it was, I was told, much cooler when I was there. But you know, I think I might have been better during the hotter season, because I am a natural night owl, and writing out on the porch got really COLD around midnight! Plus: I too liked the lizards. Sean: the bunny almost took the leaf from my hand. He was but an inch away, but would come no closer. So I put it on the ground, and he munched away happily. This bunny is famous, apparently, or famously friendly. Plus: saw an actual roadrunner. Ann: Thoughts were thunk; words were writ. UPDATE! I was told it’s okay to post the actual Endicott West URL, so I’ve done so here, and above — you should check it out! This entry was posted on Monday, December 3rd, 2012 at 9:25 pm. You can follow any responses to this entry through the RSS 2.0 feed. Both comments and pings are currently closed. 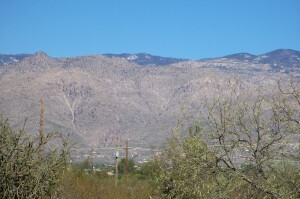 I lived at Dodge & Ft. Lowell, just below River Road and the Catalina Foothills. Palo Verdes are gorgeous in the spring when they’re in leaf. 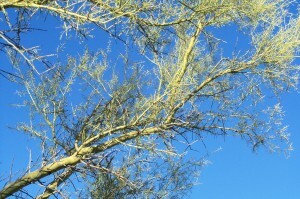 And mesquite trees are very odd and western, though lots think they’re a pest species. Maybe you’d do better in Sept. when it’s still quite warm in the day (90) and cools off to about 70 at night. Was this place on the east side of the valley? Glad you had a nice break. I was indeed in the eastern side, right up towards the Rincons. The mountains shown in most of my photos are the ones to the north, the Catalinas. I love it when I’m right (simper). I checked out Endicott Studio on the web. Terri Windling’s “Borderland” series is one of my favorites. What a nice thing this retreat is. I left Tucson in 1987 so it wasn’t there for me to be aware of. On the train through Arizona and New Mexico when I was trying to make sense of the landscape, my son said it reminded him of the Outskirts, because it really is that alien. It’s pretty strange, that’s for sure. I’d almost say that it resembles the Red Desert of the north, where Rowan herself hails from — but that only holds when considering the geology. What really makes the Southwest desert feel so strange is the native ecology, which is so very different; whereas the life that exists in Rowan’s Red Desert was introduced by humans, and so not at all weird. Plus, of course, the Red Desert gets VERY cold. More like the Gobi in that, than the US Southwest. So for weirditude, the desert around Tucson really is more Outskirts-like. Strange plants and critters — and the need to reconfigure your expectations. Of course, I’d love to actually see the Outskirts.